FindItMore | Creating a website can be a time-consuming and costly process, especially if you get a web-page crafted specially for you. Still, there are other effective means of creating web-pages. If you are looking for a quick way to launch a website for a restaurant or company that deals with selling food, here are some useful pieces of advice. First of all, you can get use of Novi Builder, a powerful HTML drag-and-drop builder, to create your web-page yourself. In fact, having Novi Membership, you’ll be able to create a multitude of fascinating websites. With Novi Membership, you’ll have a possibility to access Novi builder, as well as existing HTML Templates and 20 plugins. Novi Builder with its easy-to-use drag-and-drop functionality will let you add, switch, delete, or duplicate pages in a couple of seconds. If you are a web developer, you can use Design Mode to configure the builder’s plugins, edit the source code of the page, manage the project’s presets and the page’s content. In case you aren’t eager to edit the web-page code, you can use the builder’s Edit Mode to use various visual tools for the content editing. What is more, Novi gives you a possibility to create presets and store different elements more effectively. In addition, Novi can boast of such plugins as Background and Background Image, Icons, Countdown, Owl Carousel, and multiple other plugins that will ensure more efficient work of your website. Secondly, you can choose from a variety of responsive HTML templates that have been crafted by professionals who have taken into consideration the needs and requirements of different business niches. 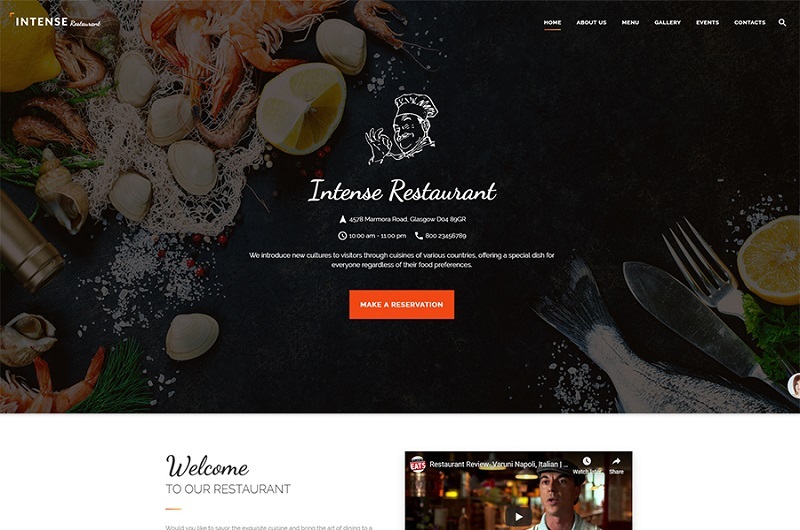 Among these templates, you’ll find a huge magnificent collection of restaurant website templates. Ready-made templates give you an exact notion of what you’ll get and what your website will look like. 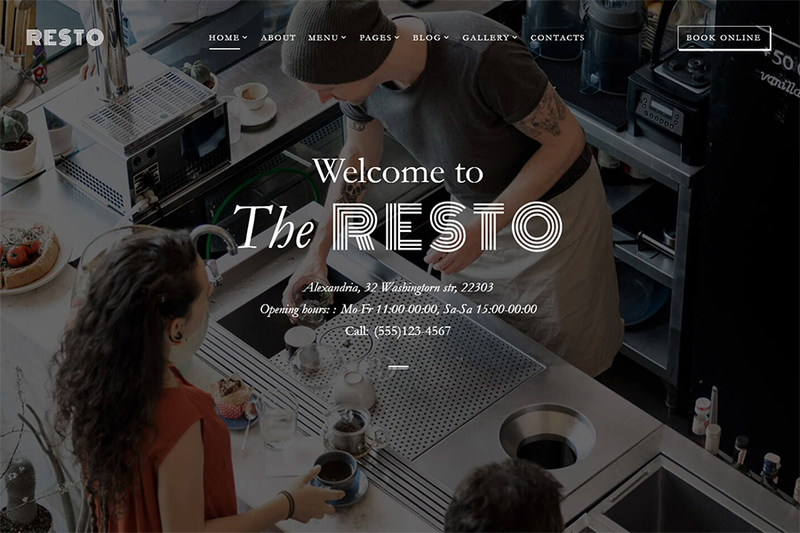 So, let’s have a look at the collection of 10 Best Restaurant Website Templates. This multi-page HTML template provides you with a possibility to create an astonishing restaurant website with appealing Parallax effect. You can easily present information on ready-made pages that include Home, About Us, News, Gallery, Menu, and Blog Post pages. 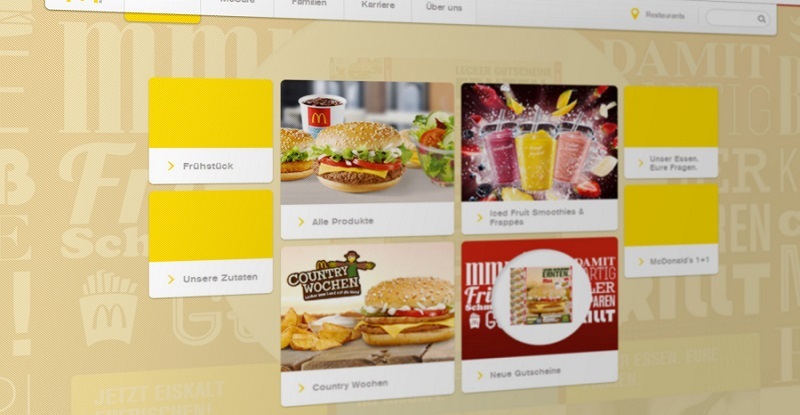 The effective Drop-down Menu and Back-to-Top button will facilitate navigation through the website, while Booking Form will guarantee the easiness of ordering goods in your online restaurant. Moreover, Contact Form and Newsletter Subscription will ensure your constant connection with your clients. Being multi-functional, this template is sure to suit the needs and requirements of various companies with different styles, including online restaurants. An enormous collection of home layouts, headers, footers, blog templates and other useful elements lets you modify and adjust your website as much as you need. Numerous visual effects, including Background video, Lazy Load and Parallax effects, will create an additional impact on your customers. Additionally, such gallery scripts as Accordion, Carousel, Isotope, and Slider, will provide you with extra ways to showcase your menu. 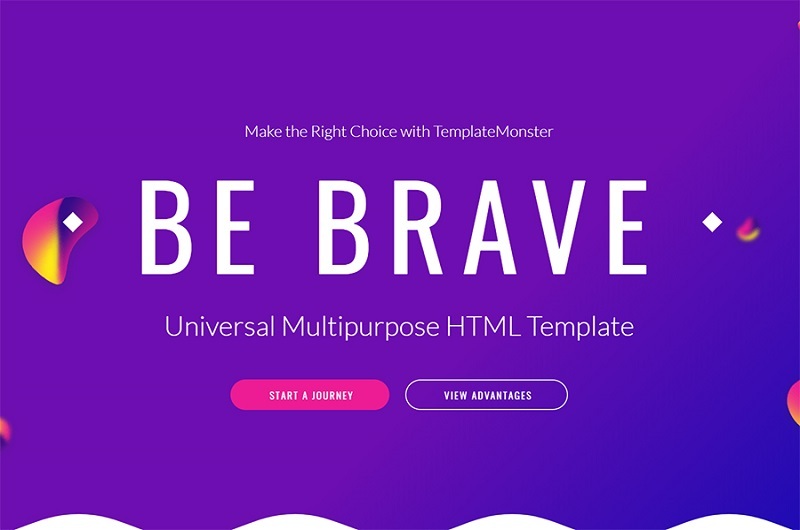 Built with Novi Visual Page Builder, this template contains an incredible number of ready-made files to satisfy various businesses, including eateries. This theme includes more than 10 eCommerce Shop templates, as well as Portfolio and Blog templates to make your company successful. With unlimited skins, colors, and fonts, you can experiment with the appearance of your website as much as you wish to find your perfect look. The site’s functionality will be enhanced by Booking, Contact, User Registration, and Login Forms. Moreover, Facebook Like Box, Instagram Board, and Tweeter Feed will promote your website in social networks. Designed in contrasting colors, this stylish template will be suitable for different restaurants and bars. An impressive variety of pages, such as Home, About, Menu, Team, Blog, and so on, will let you present various kinds of information about your establishment effectively. Multiple Gallery types of this template include Grid, Masonry, Cobbles, so you’ll be able to choose the most appropriate ways of displaying your menus or specialties. 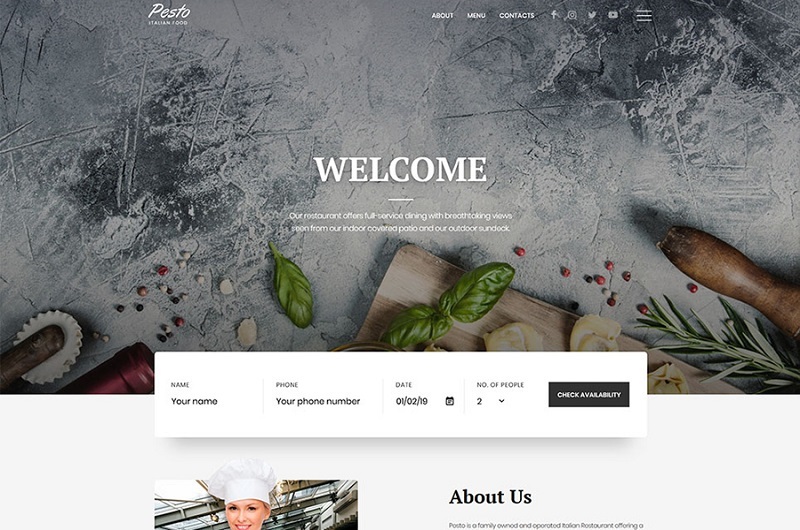 Furthermore, the template also contains free premium images connected with food and restaurant topics, as well as Parallax effect to make your page more striking. 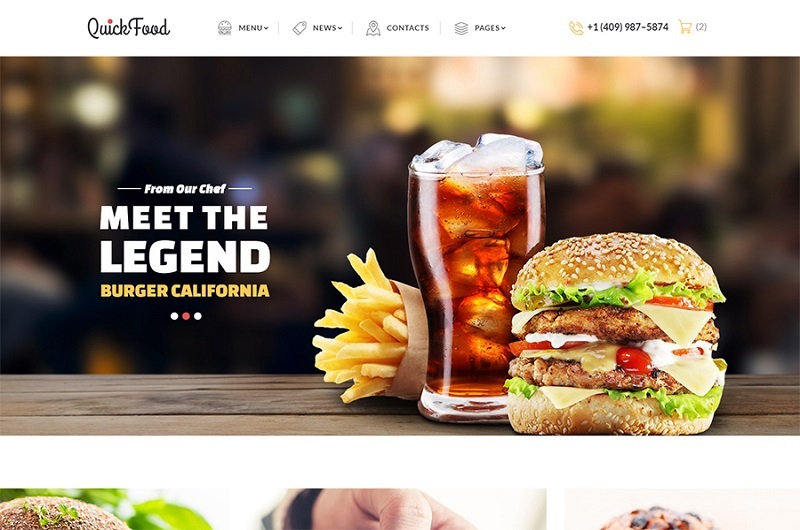 Suitable for fast food restaurants, cafes, pizzerias, or online eateries, this fashionable web-page is sure to attract attention both with its view and functionality. You can create easy-to-use drop-down menus to illustrate the variety of food available, as well as show your dishes in different gallery types, such as Accordion, Carousel, Grid, or Slider. You can also add various appetizing videos of your restaurant’s dishes as a background of your page to make people’s mouths water. Moreover, with Contact Form and Newsletter Subscription your customers will keep in touch with you easily. 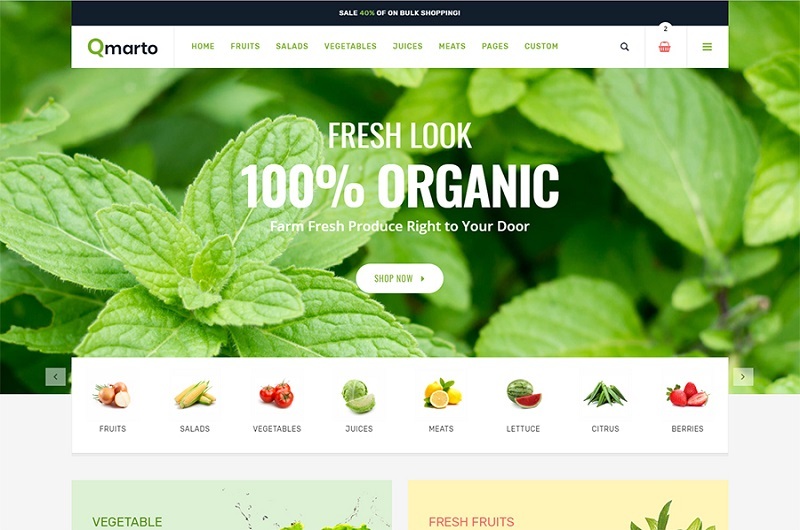 This bright template will be appropriate both for online stores and for restaurants that deal with organic food. There is a variety of ways to present your products (Grid, List, Detail) on your website, a Wish-list and Quick View to help your visitors while making choice, a blog to describe the usefulness of various goods and dishes, and a number of other pages. It will be really easy to categorize your items and present them in attractive menus, as well as create different galleries. Furthermore, this template supports several currencies and languages, so you can reach a wider audience. Containing more than 35 ready-made HTML5 pages, this template will perfectly suit different restaurants. You can choose from the classic, modern, or single menu styles, as well as showcase your information with the help of tables, tabs and accordions, progress bars, and many more. Also, you can tell your customers more about your team and create various member profiles. Numerous buttons, icons, fonts, and headers will let you modify your page and create its unforgettable look. This multipurpose template will definitely be suitable for various businesses, including restaurants, as it comprises more than 100 HTML pages and 150 UI blocks. Numerous eCommerce layouts, galleries, pre-made elements and blocks will facilitate the process of creating a successful fully-equipped website. It is also possible to run a blog, presenting the most essential and interesting information about your company. Clear contact forms and different social options will help you maintain a connection with your customers all the time. 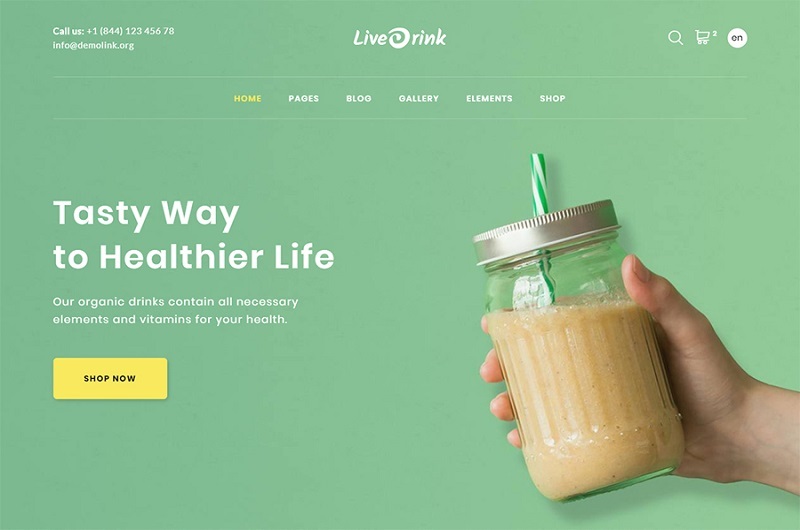 This is another sensational and lush multipurpose template that can be quickly transformed into a powerful website of a store or restaurant that deals with healthy eating and organic products. Such pages as About Us, Our Team, Testimonials, and Pricing List, which are essential parts of a flourishing website, have already been included into this template. Experimenting with page layouts and fonts, adding various UI elements and blocks, arranging your images into galleries, and inserting different forms, you’ll create an efficient and appealing website effortlessly. Moreover, multiple language support will help you attract wider audience. 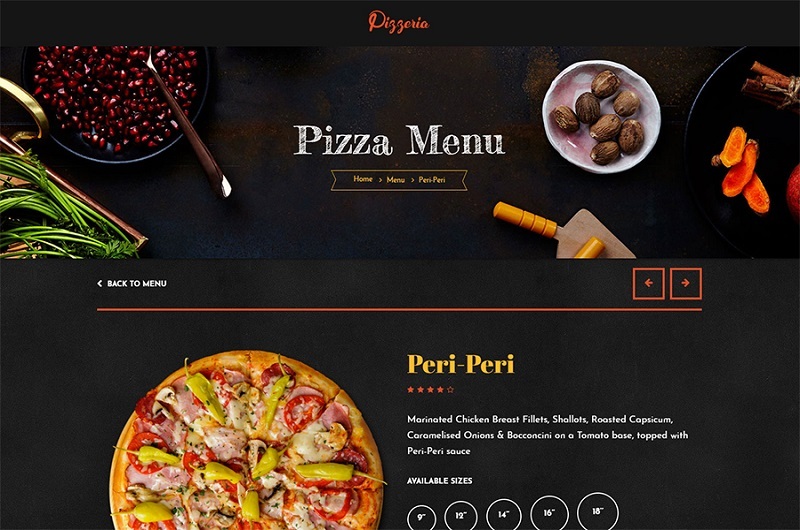 Dark-colored and eye-catching, this template was designed to satisfy the needs of pizzerias. 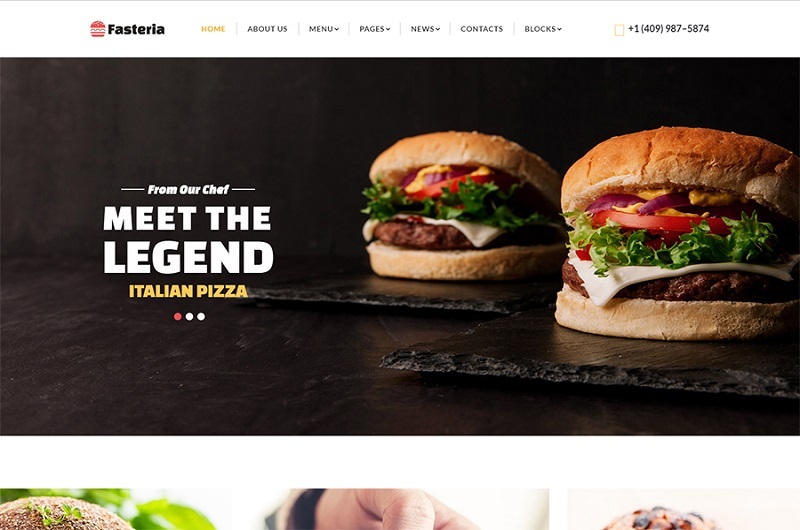 An incredible feature that this template can boast of is Pizza Builder that will let your customers choose from a variety of options easily to make their order quicker. Additionally, you can present products on single pages, create catalog pages, and add a blog to describe your specialties. Various fonts and galleries will make your page more captivating, while menus and shopping cart will enchant your customers with their functionality. Advertise your dishes and organize promotions easily with appealing countdown timers. 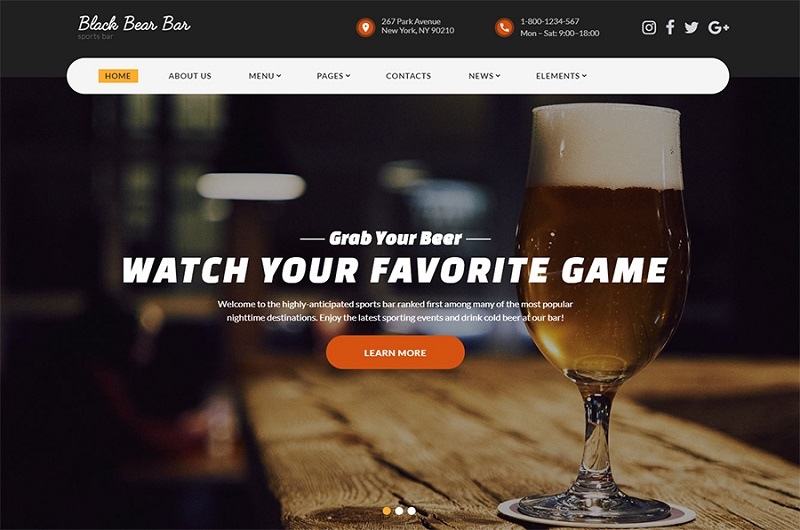 As you can see, building a website for an online eatery can be as easy as ABC if you use specially developed tools, such as website builders or ready-made templates. Choosing from a variety of templates, you can decide which options will be preferable for your particular restaurant. In general, ready-made templates give you a fast way to arrange your products into efficient menus, to emphasize goods using different types of galleries, and to provide more information in a blog. Moreover, various visual effects, such as Parallax and background videos, are designed to make your website more captivating.